Now, more than ever, Christians must shift from accidental belief to evidential trust. It’s time to know why you believe what you believe. 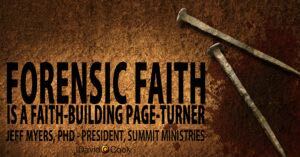 Christians must embrace a forensic faith. In case you haven’t been paying attention, Christians living in America and Europe are facing a growingly skeptical culture. Polls and surveys continue to confirm the decline of Christianity (refer, for example, to the ongoing research of the Pew Research Center, including their 2015 study entitled, America’s Changing Religious Landscape). When believers explain why they think Christianity is true, unbelievers are understandably wary of the reasons they’ve been given so far. Over seventy years ago, Lewis recognized two challenges facing the church: (1) Christians are largely unprepared to make the case for what they believe; and (2) many in the church still deny the need to be prepared in the first place. We are a largely anti-intellectual group, even though the history of Christianity is replete with some of the greatest thinkers who ever lived. In spite of our rich intellectual history, we have arrived at a point where there is a need to make a case for making a case.